The RED LINE EZ100J is an all new 100kV completely portable powder cup-gun. Designed and built to be used by all powder coaters. Serious hobby / DIY coaters who want professional coating quality. Charging voltage: Electrostatic charging voltage upto 100kV (variable from the kV controller on the gun itself) at the gun tip. All control electronics and the high voltage generator is miniaturized and fitted inside the gun itself. Powder flow: Our ForceFeed Technology ensures smooth and puff-free powder flow. This is not a gravity-feed cup-gun and no ???shaking??? of the gun is required to get any semblance of powder flow. Control the flow from a whisper to a thick cloud from the gun itself. Indicators: A large and bright Digital Meter on the rear of the gun which shows the charging voltage in kV. The LED next to this meter indicates when the gun is charging. The technology behind the powder flow and electronics employed in the RED LINE EZ100J are sourced from RED LINE?? ?s industrial range of powder coating equipments and systems. 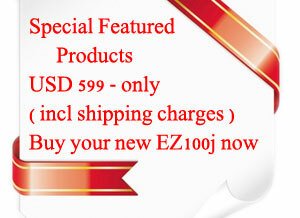 The RED LINE EZ100J is a light-weight and user-friendly powder gun.